Characteristic/ processing example "Masscomizer X"
Media-less hyper fine micronizer "Masscomizer X"
MMX has the generator that consists own unique structure, and it processes emulsification, dispersion, and crushing. Since MMX is small, light weight, and low noise, it is suitable for placing it anywhere in the factory. A generator part can be connected easily to the high pressure head, and therefore, generators of various types and the latest model can be connected. 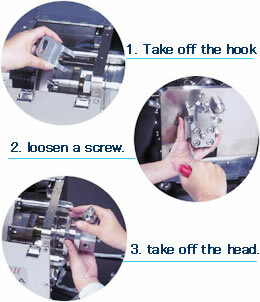 The high pressure headset is designed to be disassembled and washed easily. If there is an extra of a set, you can process different raw materials in a short time, and it makes efficient processing is possible. Measuring equipment of particle size: Beckman LS-13320(0.04-2,000ľm) Average particle size is not an arrival limit. Masuko Sangyo has an exclusive laboratory for MMX, and we accept test request.